Buffalo buffalo buffalo buffalo buffalo buffalo tofu bites! 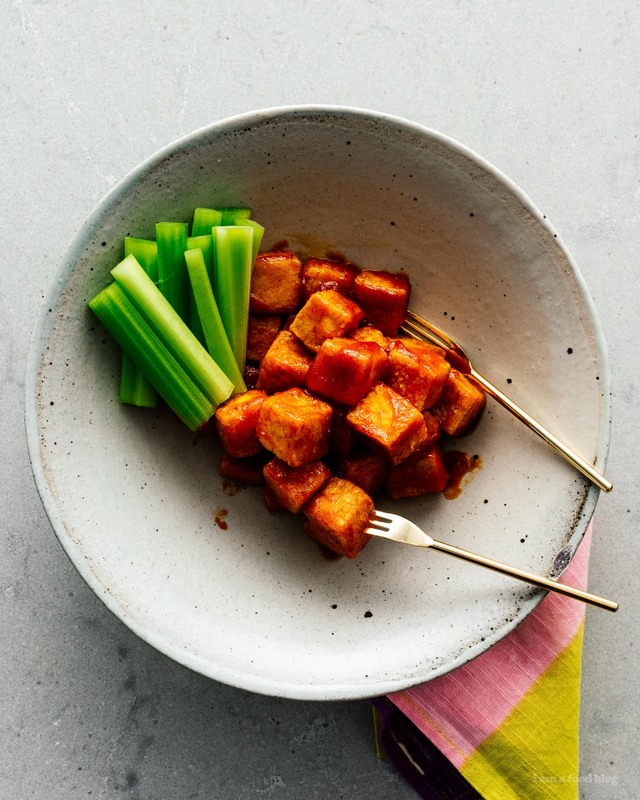 If you love tofu and you love buffalo wings, this recipe is for you. Heck, if you just like tofu, this recipe is for you. 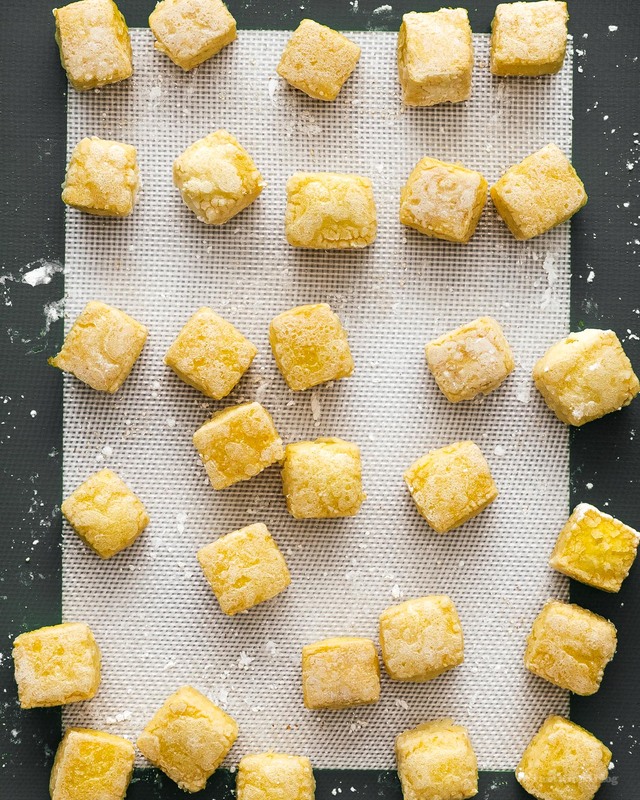 This is my favorite way of making crispy tofu in the oven: just toss in cornstarch and bake. The outsides get all crunchy and crisp and the insides stay creamy. 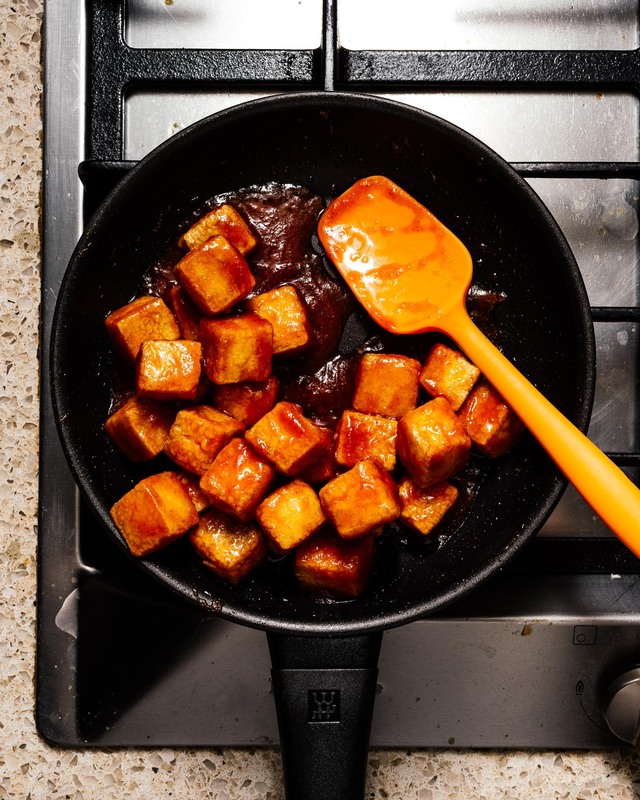 After the oven the tofu is tossed in a easy 3 ingredient buffalo sauce that’s made from sriracha, butter, and honey. It’s seriously so good. Maybe even better than buffalo wings?! 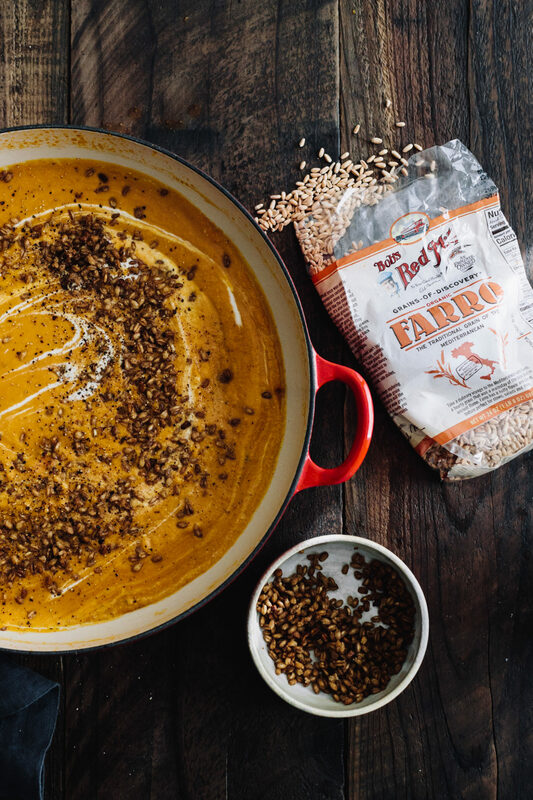 It’s a heck of a lot easier than making buffalo wings and easier to eat too. 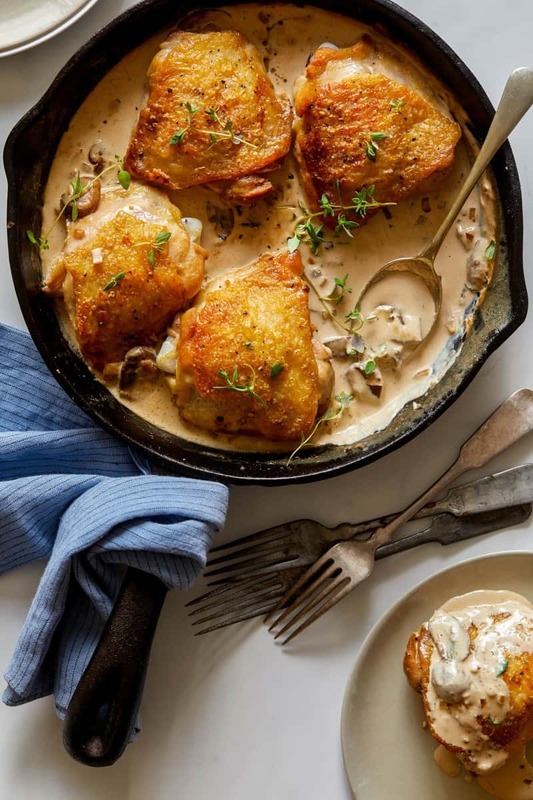 The best part about this recipe is that almost all of it happens in the oven so you can just chill out on your phone and scroll through instagram, check out cute animal videos, or laugh at memes. When you get hungry, you’ve got a spicy, satisfying snack. Seriously so good. Don’t forget the celery and ranch sauce! If you’re looking for a homemade snack, this is it! 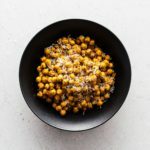 These chickpeas are crispy on the outside and creamy on the inside, with all the flavors of cacio e pepe, minus the pasta. 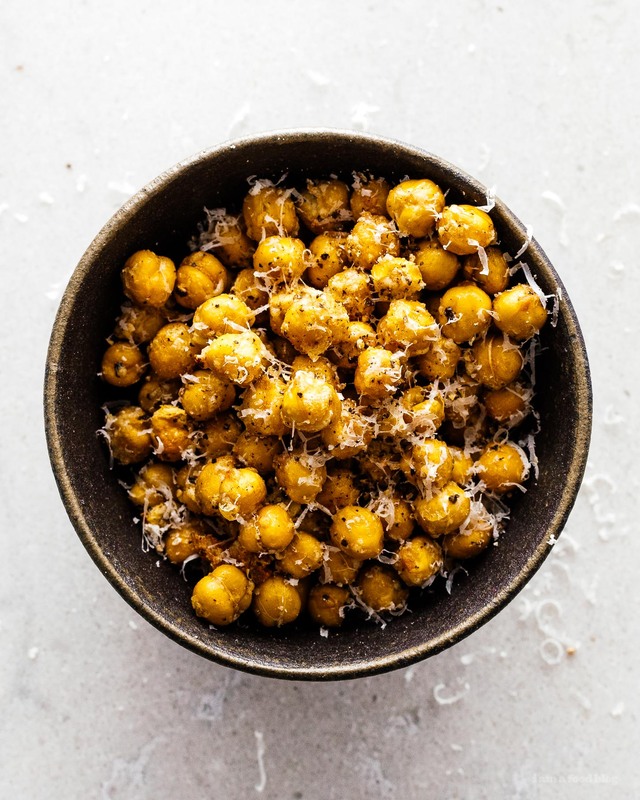 I absolutely love crispy roasted chickpeas. They’re so addictive, especially when they’re warm. 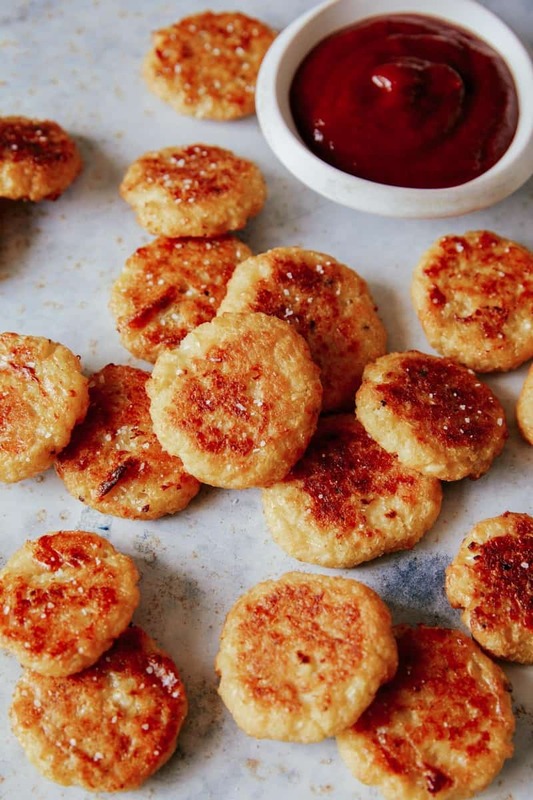 They’re crispy and crunchy and creamy. When they cool down to room temp or at kept cold in the fridge, they are delightfully chewy and hearty and just so good. 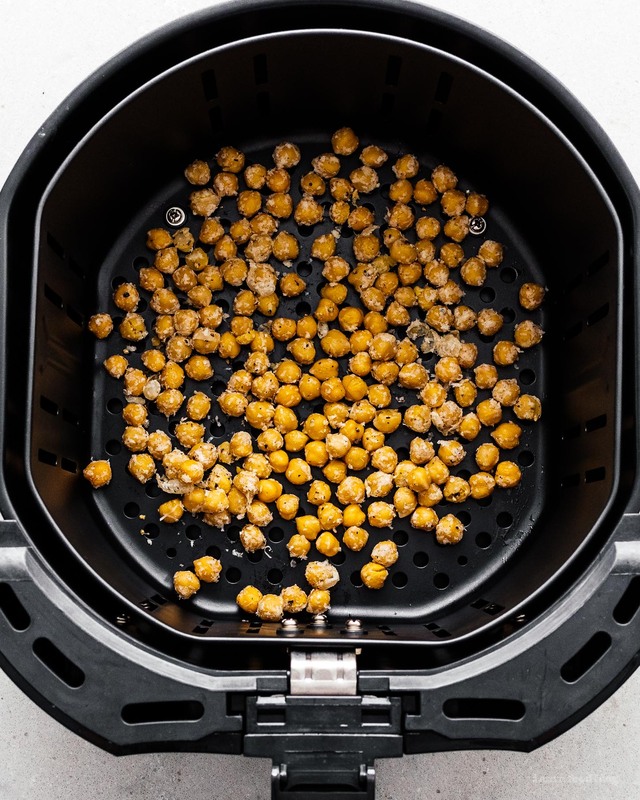 I did a little side by side comparison of oven roasted and air fryer chickpeas and even though I thought that the oven roasted chickpeas would win, the air fryer chickpeas were my favorite, hands down. They shrink a little in the air fryer, loosing more moisture, making them a more crunchy snack. The ones in the oven end up being more creamy on the inside with lightly crispy edges. Both are good, it just depends on what you like and if you have an air fryer or not. I snacked on a bunch of them while they were hot, then packed the rest up into little containers in the fridge so I can grab them as a quick snack during the week. I love them tossed on salad, pasta, or just as a snack. Pat the chickpeas dry with paper towel. 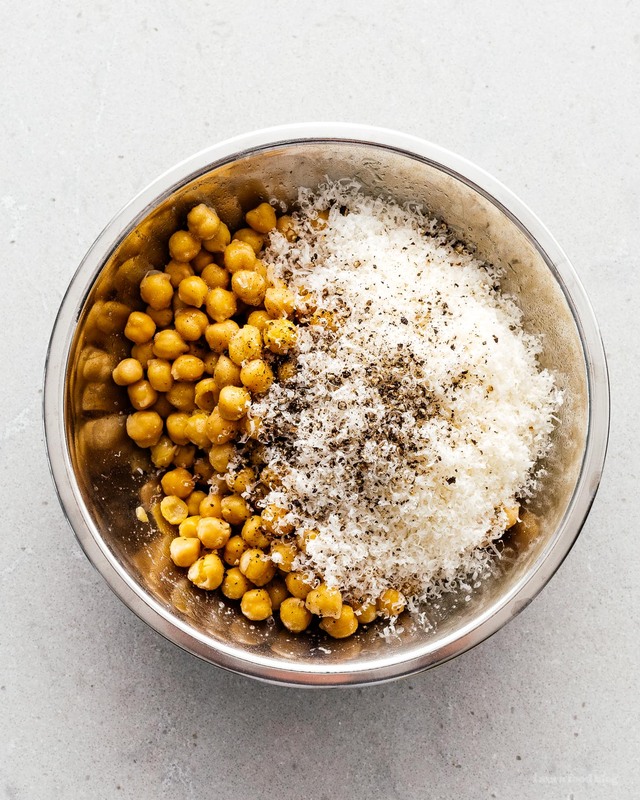 In a bowl, toss the chickpeas with oil. Toss with the parmesan and then season with salt and freshly ground black pepper. 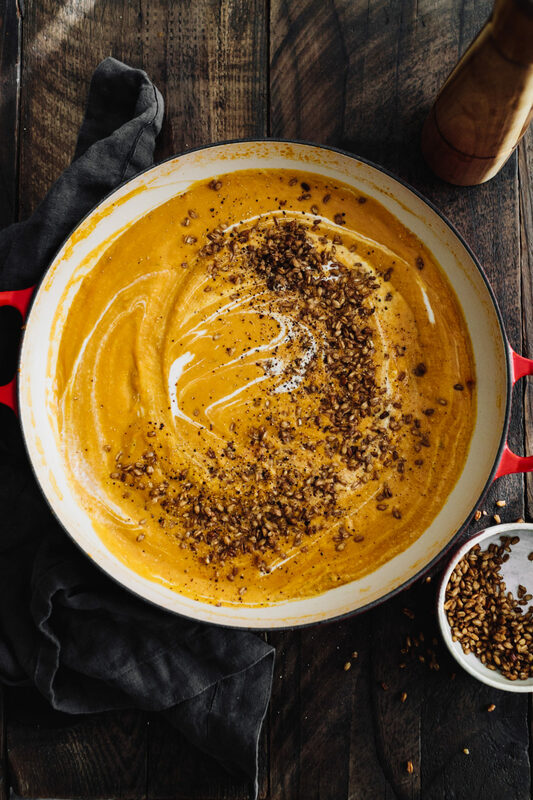 To roast: spread the chickpeas out on a baking sheet and roast at 375°F for 20 minutes, stirring half way. Remove from the oven and let cool slightly, finishing with more parmesan if desired. To air fry: add the chickpeas to the fryer basekt. Turn the air fryer on at 350°F for 5 minutes. Shake the basket, then set it again for 5 minutes at 350°F. Let cool slightly, and finish with more parmesan if desired. 1. 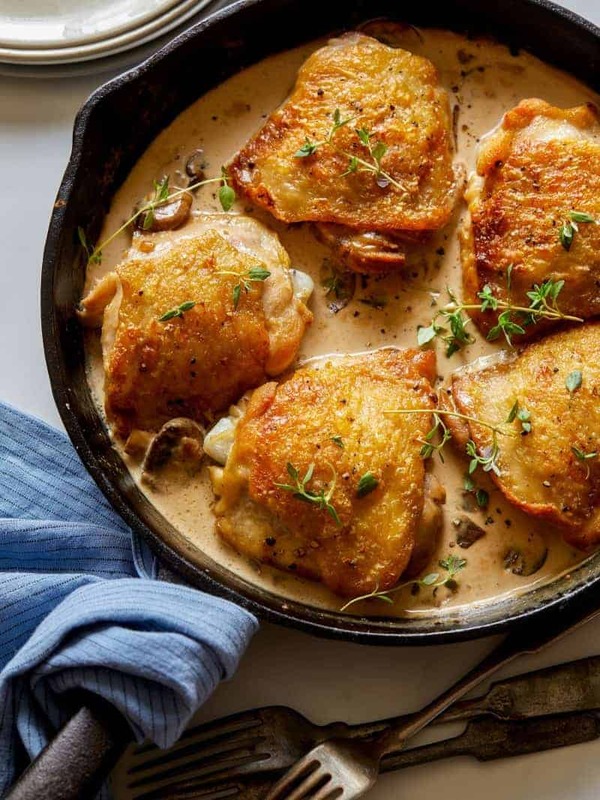 Place a large skillet over medium heat and add 1/2 tablespoon oil. 2. Add garlic and shallot and saute for 2 to 3 minutes. 3. Transfer to a mixing bowl and place skillet back over stovetop. 4. Add remaining oil to skillet and top with riced cauliflower. Season with salt and pepper. 5. Saute cauliflower until just cooked through, 4 to 5 minutes. Remove from heat and allow cauliflower to cool. 6. Transfer cooled cauliflower to a clean cheesecloth and squeeze out as much excess liquid possible. 7. Transfer cauliflower to bowl with garlic and shallot and stir together. Add remaining ingredients to mixing bowl and fold together until fully combined. Season with salt and pepper. 8. Preheat oven to 375˚F. 9. 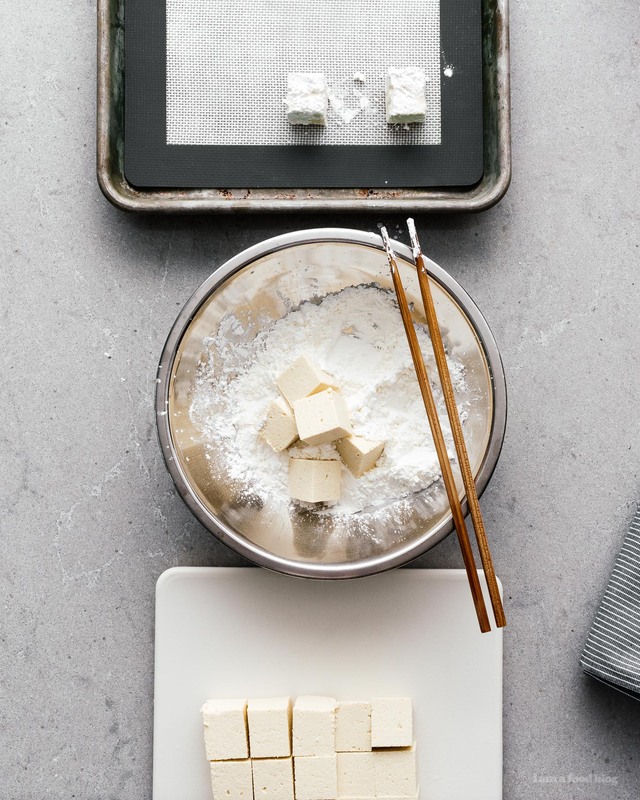 Using your hands form tablespoon sized discs (or “coins”) of cauliflower mixture and place onto a parchment lined baking sheet, 1/2 – 1 inch apart. 10. 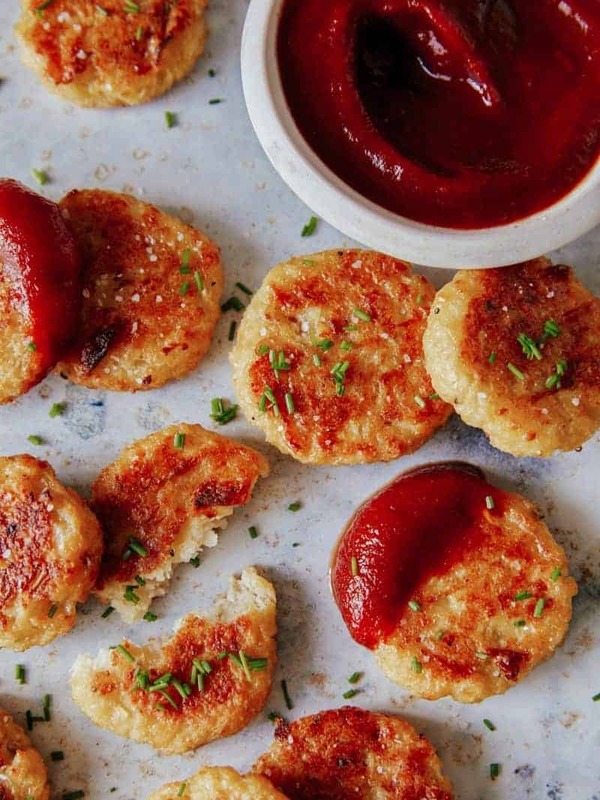 Bake tots for 20 minutes then remove from oven and flip each one. Place tots back into the oven and continue to bake for an additional 10 to 15 minutes or until tots have browned and crisped. 11. Lightly top tots with a sprinkle of salt and serve immediately. 1. Place all vinaigrette ingredients, except oil, into a large bowl and whisk together. Whisk oil into remaining ingredients, a little at a time, until fully incorporated. Remove 1/3 of vinaigrette from mixing bowl and set aside. 2. Add romaine to large mixing bowl and toss together with vinaigrette until evenly coated, then spread dressed romaine onto a large platter. 3. Add remaining vinaigrette, tomatoes, cucumbers, onion, garbanzo beans, and toasted pita bread to mixing bowl and toss together until everything is evenly coated. 4. Pour mixture over dressed romaine and top with split burrata and crispy quinoa. Lightly season with salt and pepper and serve. 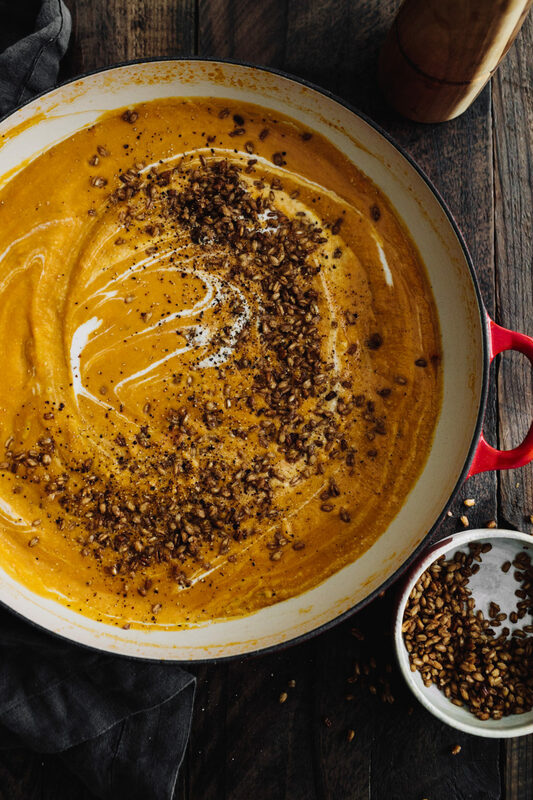 **For crispy quinoa: Melt 2 tablespoons unsalted butter in a large skillet, over medium heat, and top with 1 cup cooked and cooled quinoa. Spread quinoa into a thin layer over butter and allow quinoa to get crispy, don’t stir. Once quinoa begins to brown and crisp around edges, begin tossing and stirring with a wooden spoon until quinoa browns and crisps all over. Lightly season with salt and pepper. 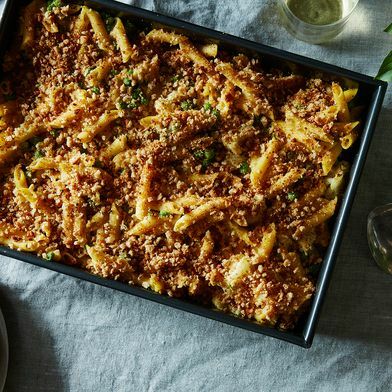 Spread toasted quinoa onto a clean baking sheet, in a single layer and allow quinoa to cool completely before using. Anyone who’s attempted cauliflower pizza crust knows its primary pitfall: a soggy center. 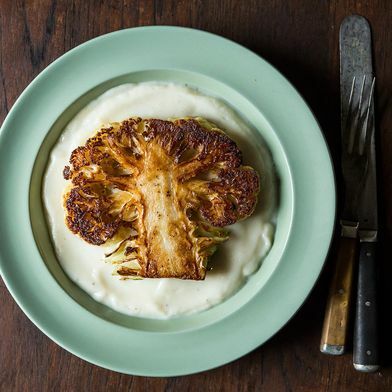 With only a few exceptions, recipes for cauli crusts often result in something that, while delicious, requires a spoon and a bowl to eat. 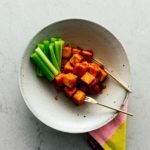 When we first stumbled upon a photo of Lily Simpson’s version in Detox Kitchen Vegetables, we were taken aback by its deeply tanned, amber-tinged edges, and what looked like a thin, firmly crispy center. We took things to the test kitchen, and were not disappointed. Thanks to Simpson’s instructions, plus a few improvisations of our own, we’re happy to report that we have a plant-based pizza keeper on our hands. As Simpson says, “A perfect cauliflower pizza has a crispy base and the key to that is making sure it is pressed out as thinly as possible.” She recommends a thickness of about 1-centimeter, or a little more than 1/3-inch. Any thicker, and you’re likely to end up with a crust that has the texture of a baked potato, rather than a cracker. 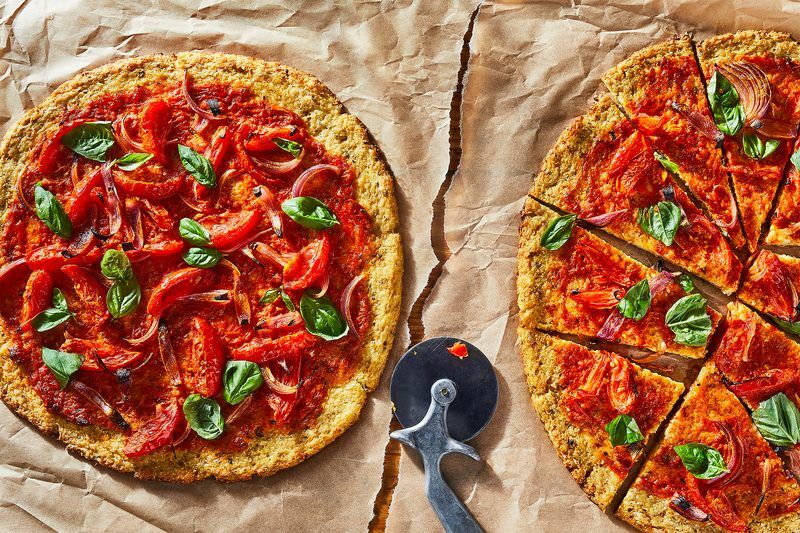 After you’ve pressed out your cauliflower crust, if you have time, Simpson recommends popping it into the fridge to chill for 20 to 30 minutes. This step allows the crust to meld together better, and facilitates maximum crispiness once the pizza is baked. 3. Take a Page from Pie’s Book. As with pie crusts, we’ve found that par-baking our cauliflower crust before topping it with sauce and accoutrement is crucial for firming up and drying out the center. We’d recommend baking Simpson’s crust for 10 minutes before removing it, adding the toppings, and finishing it for another 15 to 20 minutes in the oven. Beyond its crisp crust, we love Simpson’s cauliflower creation because it’d be equally good as a light weekday dinner, or as the star of a Saturday night pizza party. 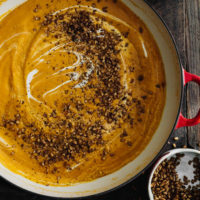 “Marinating” the tomato topping in lemon zest is a clever way to brighten late-season tomatoes, and the addition of acid balances the starchy flavor of cauliflower. Double down by tossing in a teaspoon or so of lemon juice as well. Like with any good pizza, the recipe is flexible: Swap out the plum tomatoes for another type, or for whatever vegetable looks best at the farmers market. You could use Simpson’s instructions just for the crust, and pile on your favorite sauce and toppings: Pesto, vegan “cheese,” and thinly sliced fridge pickles would all be excellent. What are your favorite toppings for cauliflower pizza? Let us know in the comments!